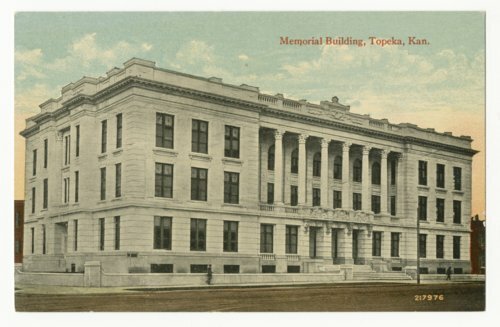 This is a postcard showing the Memorial Building located at 120 W. 10th Street in Topeka, Kansas. The construction of Memorial Hall was financed by war claims paid to the State of Kansas by the federal government. In 1909, a legislative money appropriation act was passed. A commission selected the site, acquired the land title, and supervised construction of Memorial Hall. On September 27, 1911, President William Howard Taft laid the ceremonial cornerstone. The building was completed in 1914. In that same year, the Kansas State Historical Society moved to the Memorial Building and remained at that site for 80 years. In 1984 the Kansas Museum of History moved to an 80-acre site in west Topeka near the Potawatomi Mission leaving the remaining agencies still housed in the Memorial Building. The historic Stach School later joined the complex. During July and August 1995 the collections of library, archival, manuscript, and archeological materials were moved to new facilities in the Research Center adjacent to the museum. In this headquarters, the Historical Society was reunited at one location. Since 2000, Memorial Hall has served as headquarters for the Kansas Attorney General and Kansas Secretary of State.